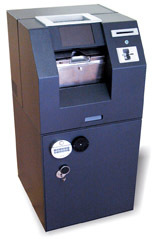 ARCA, the world’s largest manufacturer of Teller Cash Recyclers (TCR). Since late 90’s, ARCA cash processing solutions have helped banks and retailers worldwide manage their cash transactions more efficiently, cost-effectively, and in total security, and this has made ARCA and their partners a market leader. ARCA retains the position of the world’s largest manufacturer of scanners for banking automation. There’s no other company that today owns the same know-how, market experience and understanding, R&D capabilities and outstanding manufacturing as ARCA has. Market analysts estimate that by the beginning of 2012 the "smart safes" only in US are reaching 50,000 units. Almost half of this population is connected in cash management digital networks supervised by cash handlers or specialized "RCM" companies, enabling acknowledgment of provisional credit by the associated banks. The adoption of enabling technology by more "smart safe" manufacturers, new advanced models right-sized for every application and growing banks interest to join the RCC ecosystem, this growth is expected to continue the years to come. However we have to admit that beyond the side benefits of cash handling processes simplification and the increased security, it is one primary benefit that attracts the retailer business decision makers to join this trend, acquiring "smart safe" devices. This is the provisional credit awarded by the bank in return to a "smart safe" connected in their IT systems. This is changing the paradigm of remote deposits capture and management, by challenging the re-engineering of the overall cash cycle within merchants and between merchants, armored couriers and banks cash vault networks. Apparently RCC introduction is a decisive step towards reducing the cash acceptance and processing cost for all stakeholders of the cash flow ecosystem. A smart safe is capable of interrogating with the user, offering a multitude of services. Typically it is about deposit and banknotes counting; on certain devices it also handling withdrawal and exchange with different denominations. The system is capable to provide certain information in form of on–screen reports, such as financial transaction history of a user or a supervisor, as well as cash inventory report with banknote denominations breakdown. The user interface supports the concept of "shifts", where the deposits are under the custody of a shift–supervisor. Last but not least, the user interface is responsible to manage the CIT cash offload and bag or cartridge replacement process. On the User Interface backend co–resides a communications agent responsible to synchronize in real time the smart safe data with the central Cash Management Network supervisor control and monitoring system. For most merchants, couriers and banks, cash handling is still predominantly manual, but a growing number of institutions are starting offering Remote Cash Control products that sweeten the deal by offering provisional credit for deposits that are counted and validated by a "smart safe" that also provides audit trails for cash. 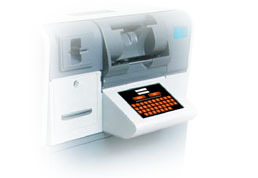 CsExtra with its capacity of up to 4,000 banknotes meets various customer and business needs. Even in small shops where space is limited, its small size and footprint allows this unit to be placed under a counter or in a small back office. It is equipped with a long edge banknote validation module, depositing banknotes swiftly in a innoivative security bag housed in the safebox. 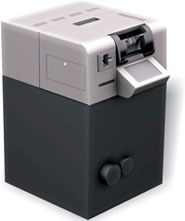 SID is a robust and sturdy device designed to deposit banknotes. After operator identification, the system allows to deposit bundle of mixed banknotes. After accurate counting and validation, they are then deposited into a self-sealing plastic bag located inside a robust and secure safe. Each deposit transaction is monitored and all the data are available to the customer and to the bank. A receipt for each transaction is issued, which includes details of notes (quantity, denomination and total value). FID is a breakthrough innovation by ARCA. Its name stands for Fast Intelligent Deposit. It is a self-banking solution that allows users to deposit banknotes and cheques in bulk at an impressive speed. It is aimed to replace deposits made using envelops (as in night-drop deposits) as well as automated solution either at the bank's lobby or in a self-service area, providing great improvement and benefits to banks and users. It can be used integrated in a Kiosk or inside an ATM. Automatic Feeder capacity: 300 docs. Capture front and rear image of the checks at 200dpi grey scale. 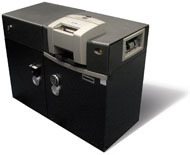 CM24B is a high-end smart safe designed for handling and control of large volumes of cash withdrawal and deposit. The cash fitness sorting feature allows the recycling of only the fit banknotes, while the unfit ones can be removed from circulation. The banknote "recycle" function reduces the money held in-place to a minimum. 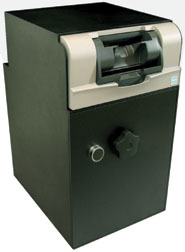 There are two separate safes, the main for recycling and the side safe for large deposits. Speed: 100 notes bundle in 45secs avg.